What is the future of work and learning? Great question, and thanks for asking. We New Zealanders are very curious about this - google trends tells us out of all the countries worldwide, 'the future of work' is most searched for in New Zealand (at least that was true when I last looked). We're ahead of the curve as usual. The world is speeding up. Technology is accelerating, and as humans we can't keep up with the pace. This means we need to prioritise and learn skills in new ways and contexts, so we can use them immediately. We also need to protect ourselves from information overload by choosing what we engage with and when. As learning professionals this means we need to be careful about the learning we create. You can read more about this in Thomas L. Friedman's book 'Thank you for being late' or Singularity U. Or contact Anna, who loves to talk about this. Of course the rise of automation and AI means some jobs may be replaced by robots in the future. However, new jobs are being created every day. Dell say 85% Of Jobs That Will Exist In 2030 Haven’t Been Invented Yet. It's not time to worry yet, it's time to keep on learning. Do you want to find out more? Keep reading, or contact Anna, who loves to talk about this. what are the future trends influencing work? Social responsibility, resilience and sustainability become even more important. All this means companies are going to be very keen to keep talent and we're going to need to stay talented and keep learning to be in demand. These big trends have been shortened above, to give you an overview. To find out more, a few of the many sources for this information are Jacob Morgan (in the video below), Forbes and Deloitte. Do you want to find out more? Keep reading, or contact Anna, who loves to talk about this. In March 2019 we had great conversations with many friends - new and old. So much learning to do. 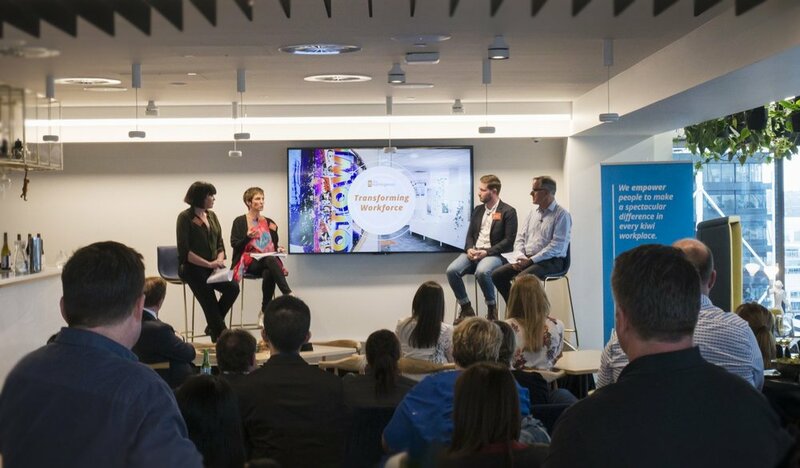 I led the conversation, with 4 of my clever and diverse colleagues on the implications of future of work for organisations in NZ. We talked about the leadership skills we’d need in the future in an interactive presentation, and workshop.